Ranking well is considerably more difficult in secondary regions than it is in your original area of operation. At home, you have the advantage of local knowledge. You understand the slang terms, the regional dialect, and the cultural inclinations that factor into what people search for and how they search for it — plus your physical presence will be great for local SEO. At the same time, it’s perhaps more important to rank well overseas. After all, you won’t have the varied marketing opportunities and connections that are available to you on your home turf. And without any direct advocates in the area (or any physical presence), the only way people will hear about your business is through search. From a technical standpoint, though, there are additional SEO factors that come into play when you try to span regions. 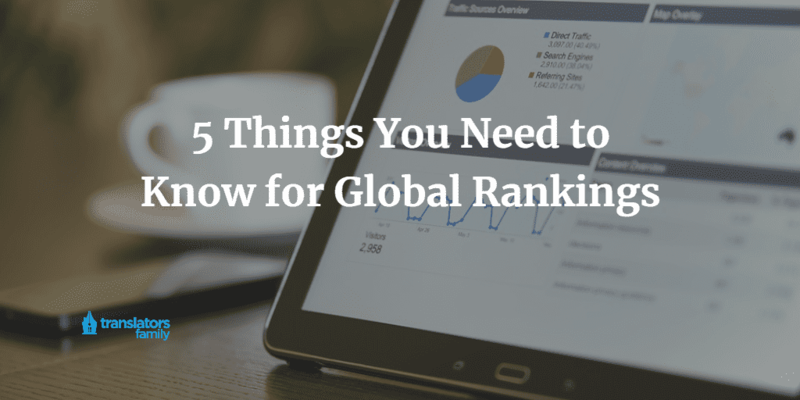 In this piece, we’re going to cover 5 things that you need to know if you’re aspiring to rank globally, not just locally. Let’s begin. Google can’t always find a suitable version of a site to provide, which can cause confusion. Imagine that you set region-specific versions for everywhere in Europe and the US, but then someone from another region submits a search — with no clear idea of which version is best for them, they might get something entirely useless for their needs. Or imagine that a browser fails to submit the regional tags that allow locational detection. Either because it can’t find anything fitting the criteria, or because no criteria are provided, a search engine needs a catch-all version of a site: something to be provided when nothing else fits. This is what the x-default tag is used for. Be aware that it can point to any version you want. Even if you’re serving the same language to every region you’re trying to rank in, you need to have a distinct page for the area, but you can’t simply confirm that your site versions are being indexed and leave it at that. You need to tell Google which version is intended to serve which region, and you accomplish that using the hreflang HTML tag. Depending on the CMS you’re using, these tags might be configured for you (if you want to migrate to a platform with better tagging, picking from websites for sale is an option that can save time), but you can’t trust to that because poor hreflang tags are likely to prove very damaging. Imagine discovering to your horror that the German-language version of your site is being served to French searchers owing to an incorrect tag. Check your tags manually in accordance with best practices and confirm that they’re being indexed correctly. When you implement hreflang tags, bear in mind that you don’t strictly need to specify the region of a page. If you know you’ll be serving various regions speaking the same language and you have a variant for each and every one of them, then by all means specify, but it isn’t necessary. Look at it this way. If you have two English-language versions of a page and tag one as en-us and the other as en-gb, that setup will work fine for anyone from the US or the UK, but it won’t be so useful for English speakers from other areas. If the content is sufficiently generic to apply to any English speaker, then just set it as en and leave the region blank. The rel=canonical tag is important in general SEO for clearing up ambiguity and protecting the perception of the original or definitive version of a page. The online world attracts a lot of duplicate content, and it’s a particular danger when it comes to regional versions (albeit mainly when they share a language). You might think either that you don’t need canonical tags to differentiate pages that are marked as distinct through hreflang tags, or that the canonical tag for each page should refer back to the original version, but wrong on both counts. You need a distinct canonical tag for every regional version, with each tag identifying that specific version as the canonical version for the region. If you have carefully-translated pages and a solid navigation for swapping between them, you might think it’s reasonable to risk it and simply assume that Google will figure things out eventually. Well, it’s true that it might, especially since the algorithm is regularly updated. Perhaps one day in the near future the hreflang tags will no longer be necessary — but not yet. And the danger with leaving out regional tags is not that your pages will not rank at all, because that’s a matter for indexing, not for region tagging. The danger is that they’ll compete for rankings. If someone in Spain searches for your company and Google doesn’t know which one is the regional preference, it might rank two or more versions of your site. What happens then? The searcher unexpectedly has to choose a version and might end up on the wrong one, leaving with a bad impression. What’s more, because you’ll realistically only get one click out of the multiple rankings, the unclicked versions will be perceived as less relevant in general, not just in that specific region. Over enough time, you should see the primary version of your website suffer in the rankings because it keeps being served at inappropriate times. So be sure to follow correct regional tagging procedure, and you’ll give your site the best chance of ranking globally. Victoria Greene is an ecommerce marketing expert and freelance writer who aspires to one day be a polyglot (she just needs to find the time). You can read more of her work at her blog Victoria Ecommerce.